Okay, I know. It’s not a great name. Or it’s a brilliant name if you’re prone to making jokes in terrible taste. And I am. POCKET JUICE I MEAN REALLY. But 12-year old humor aside, this is the Tzumi Pocket Juice Charger, and this stupid little thing has saved my bacon so many times that I plug it in at night to charge just like my iPhone. And my headset. And camera battery. Anyways. 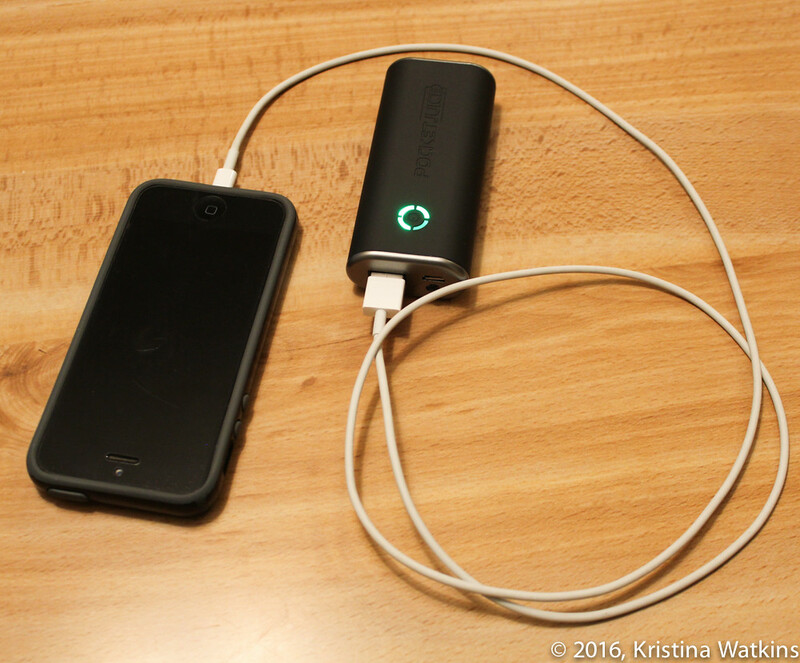 It’s basically a portable battery pack that charges anything you can connect to with a USB cord. There are a lot of versions of this little thing but mine is black and has a 4000 mAh output. I have no idea what that means. But I do know that I probably make north of a thousand calls, emails, texts, photos, social media, Kindle and Audible activities in any given day. So even though I start with it fully charged and it lives on a charger whenever I’m at a desk or in my car, I will inevitably run out of battery life just as I roll into Costco and really need to listen to music on my headset so I can drown out the screaming. (Mostly mine.) Or when I have a brilliant thing to say on video. Or have found a brilliant view that should be posted. Or if my out-of-town clients want to FaceTime through a property with me. “Low Battery” is my nemesis. This unfortunately-named device does the trick. I bought it before I had to do two 1-hour long FaceTime walk-throughs back-to-back. You can’t very well walk through a home while tethered to an outlet. So I literally opened this package, plugged it in, and 2 hours later was able to use it. It works like a supercharged wall charger; for my use that day I had it plugged into my phone so it was charging while I FaceTimed, charger in my pocket and my lightning cable hanging out connecting the two. It wasn’t the most graceful thing but it got the job done well, I was able to take care of my clients without any further delays or unprofessional technical difficulties. It charges my devices faster than plugging it into the wall. (I have no scientific proof of this.) I use it on Open House Tour days, when we’re all bargaining for the one car charger which you can really only use for a few blocks until you get to the next open house and have to unplug it. But with this little devil, I can just carry it with me if times get lean. How about if I’m cooking dinner and need to be looking at a recipe or taking a call or running Pandora? I can throw the charger in my pocket and keep on keepin’ on. Truly, when I get the Low Battery notification anymore at home I just plug it into my charger, not my wall outlet. Also? I live in a 1955 house. Bless their hearts but in the 50s they couldn’t even fathom needing more than two outlets per room, so unless I want to lay on the ground underneath a precious outlet to finish a call, this solution is magical. Imagine airports! Conferences! The possibilities are endless. Scratches! Not dog hair. This time. There are a lot of versions Tzumi makes: mine is black and has the battery indicator in green on the front, and was $20. Four lights is fully-charged. Blinking is charging. 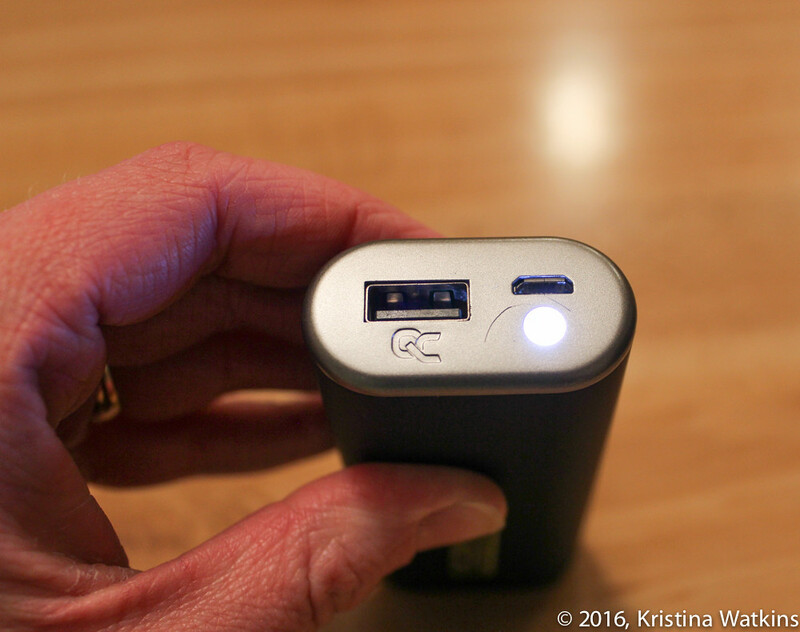 Hold the power button for some amount of time and it turns a bright light on, which is helpful but curious, as iPhones have all but eliminated the need for pocket LED flashlights. But I’ll take it. The silver bits on the end do scratch very easily though. The photo above could just as easily be showing you dog hairs but for once, it isn’t. Mine came with a USB to mini-USB for charging, and I had to supply my own lightning cable to connect my iPhone and charger. But who cares? Bacon: saved.